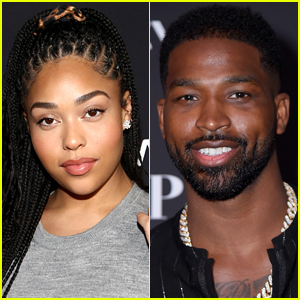 Spotify’s Secret Genius Awards brought out all the stars! 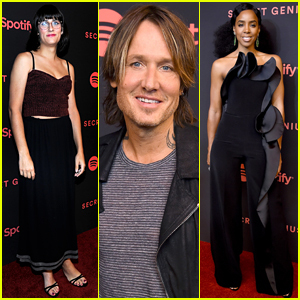 Teddy Geiger, Keith Urban, Kelly Rowland and more were in attendance at the star-studded event, held at The Theatre at Ace Hotel on Friday night (November 16) in Los Angeles, Calif.
Also seen stepping out for the event were Bebe Rexha, Charli XCX, Ne-Yo (who hosted the event), Becky G, Quincy Jones, Soleil Moon Frye, Jhene Aiko, and Andrew Watt, Ali Tamposi and Benny Blanco. FYI: Kelly is wearing an Azzi and Osta outfit, RockHer jewelry, Stella Luna shoes, and Narcisa Pheres earrings. Jamie Foxx walks the carpet at the 2018 Chrysalis Butterfly Ball on Saturday evening (June 2) in Los Angeles. Also in attendance at the event were one of the co-chairs Rebecca Gayheart with her daughter Billie, 8, LL Cool J, Curtis Stone (an honoree this year) with Lindsay Price, Carter Jenkins, Soleil Moon Frye, and more. Over the years, the ball has helped raise $15 million to help individuals out of poverty and homelessness. The annual event is held every June. Chrissy Teigen & Rachel Zoe Wear Matching Looks at Fashion Event! Chrissy Teigen and Rachel Zoe wore matching dresses on the red carpet at the Rachel Zoe SS18 Presentation at the Sunset Tower Hotel on Tuesday evening (September 5) in West Hollywood, Calif. The model and fashion designer posed for some cute photos after realizing they were wearing nearly the same dress with the exact same print. Other celebs at the show were Goldie Hawn, Sara and Erin Foster, Selma Blair, designer Jennifer Meyer, Molly Sims, Nicole Richie, Rebecca Dane, and Soleil Moon Frye. In addition, Rachel‘s husband, Rodger Berman, was also there to show his support! FYI: All the attendees are wearing Rachel Zoe looks. Chrissy is wearing earrings by Vita Fede and rings by Vardui Kara and EFFY Jewelry. Guests sipped on Belvedere cocktails. Hollywood Moms Bring Their Kids to 'Lost in Oz' Premiere! 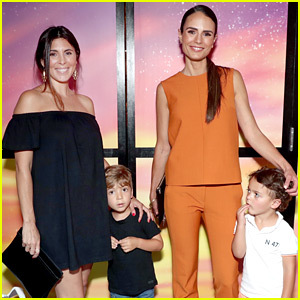 Jordana Brewster and Jamie-Lynn Sigler pose for a photo with their sons while attending the premiere of the new Amazon Prime Video series Lost in Oz on Tuesday afternoon (August 1) at NeueHouse in Hollywood. Soleil Moon Frye was their with her daughters while Shiri Appleby attended solo. Jamie-Lynn is currently pregnant with her second child! Inspired by the Oz book series by L. Frank Baum, Lost in Oz follows twelve-year-old Dorothy Gale and her trusty dog Toto as they search for Glinda the Good in the hope that she can send them home to Kansas. FYI: Jordana is wearing a Victoria Beckham top and pants and John Hardy jewelry. Halle Berry shines on the purple carpet as she arrives at the Chrysalis Butterfly Ball on Saturday night (June 3) in Los Angeles. 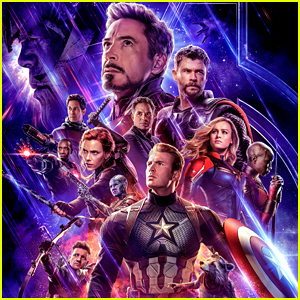 The 50-year-old actress was joined at the event by Jaime King, Zendaya, Edgar Ramirez, Common, Molly Sims with her husband Scott Stuber, James Van Der Beek and wife Kimberly, Soleil Moon Frye, Dania Ramirez, and Jordan Peele. The Butterfly Ball benefits the Chrysalis non-profit organization that helps fun programs and services to help homeless and low-income families find new jobs. The event’s co-chair Rebecca Gayheart and her husband Eric Dane made a stylish arrival as they were joined by Elizabeth Berkley, Jason Bateman and wife Amanda Anka, Ben Feldman and his pregnant wife Michelle, along with Patricia Arquette and boyfriend Eric White. FYI: Halle is wearing a Gosia Baczynska dress. Jaime is wearing a Miu Miu dress. Zendaya is wearing a Mario Dice dress with Joan Hornig earrings and rings by Graziela Gems and EF Collection. Rebecca is wearing a Derek Lam dress.